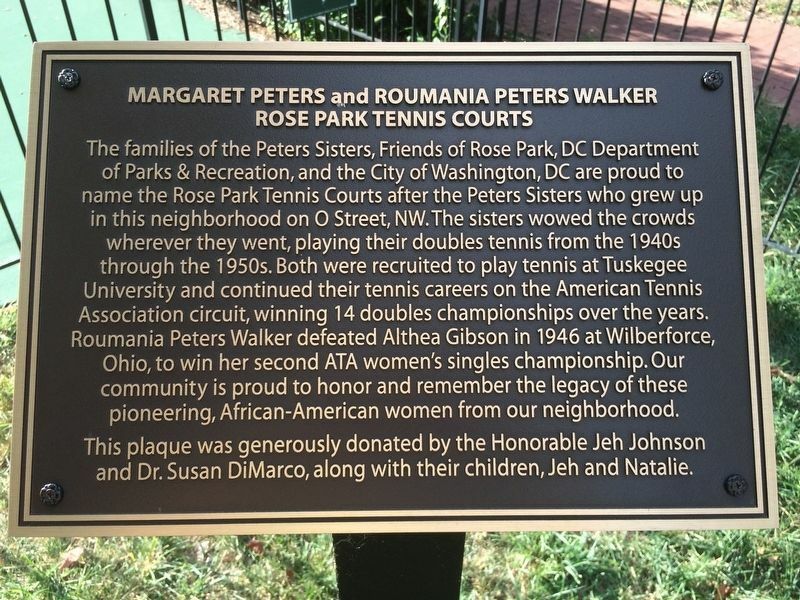 The families of the Peters Sisters, Friends of Rose Park, DC Department of Parks & Recreation, and the City of Washington, DC are proud to name the Rose Park Tennis Courts after the Peters Sisters who grew up in this neighborhood on O Street, NW. The sisters wowed the crowds wherever they went, playing their doubles tennis from the 1940s through the 1950s. 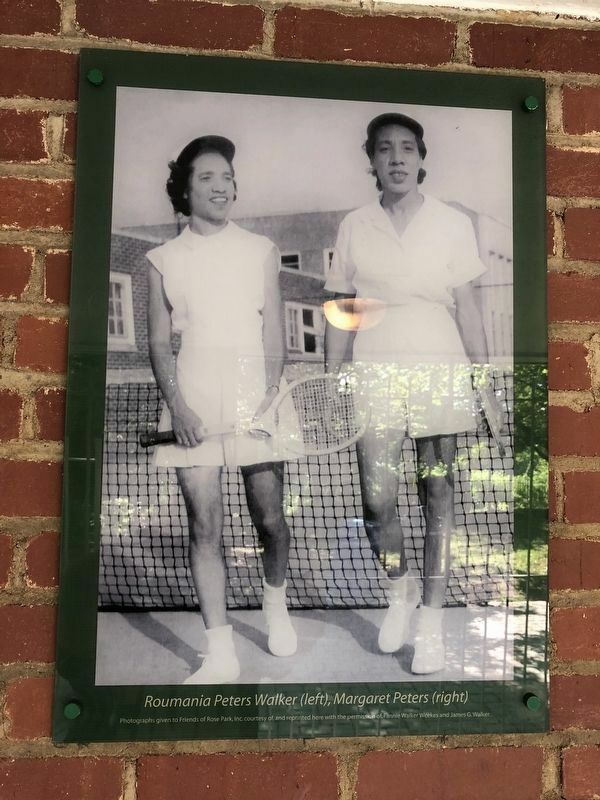 Both were recruited to play tennis at Tuskegee University and continued their tennis careers on the American Tennis Association circuit, winning 14 doubles championships over the years. 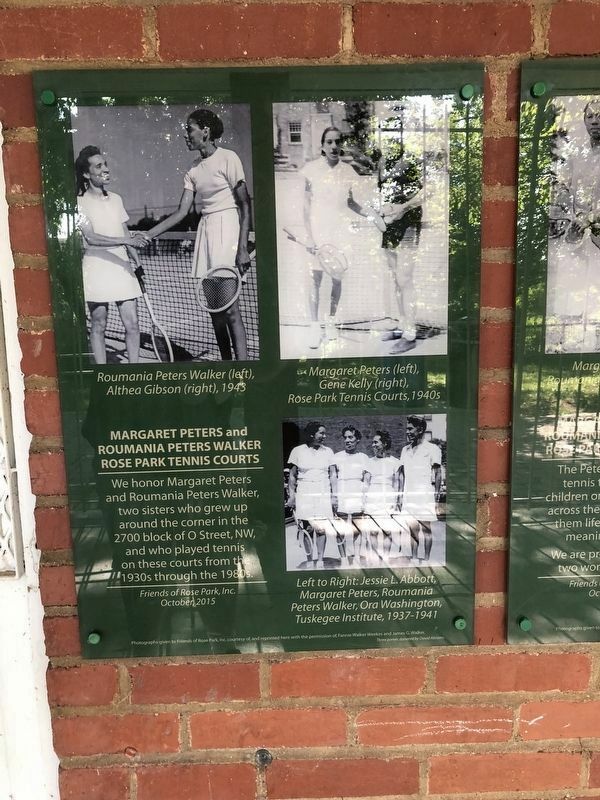 Roumania Peters Walker defeated Althea Gibson in 1946 at Wilberforce, Ohio, to win her second ATA women's singles championship. Our community is proud to honor and remember the legacy of these pioneering African-American women from our neighborhood. This plaque was generously donated by the Honorable Jeh Johnson and Dr. Susan DiMarco, along with their children, Jeh and Natalie. Erected by the Honorable Jeh Johnson and Dr. Susan DiMarco, along with their children, Jeh and Natalie. 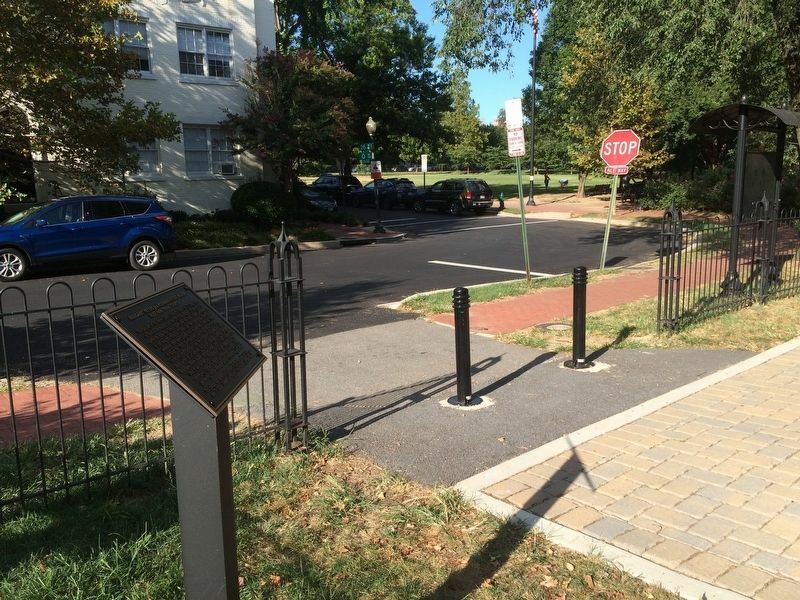 A view of the marker looking towards the northeast out onto O Street and 26th Street, NW. N, 77° 3.299′ W. Marker is in Georgetown, District of Columbia, in Washington. Marker can be reached from O Street, NW 0 miles from 26th Street, NW. Touch for map. Marker is at or near this postal address: 2604 O Street, NW, Washington DC 20007, United States of America. Touch for directions. Other nearby markers. At least 8 other markers are within walking distance of this marker. Rose Park Recreation Center (within shouting distance of this marker); First Baptist Church, Georgetown (about 400 feet away, measured in a direct line); Herring Hill (about 400 feet away); Epiphany Catholic Church (about 500 feet away); Before the 1800s (about 700 feet away); During the years following the Civil War (about 700 feet away); Georgetown Refuge (approx. 0.2 miles away); Dumbarton House (approx. 0.2 miles away). Touch for a list and map of all markers in Georgetown. 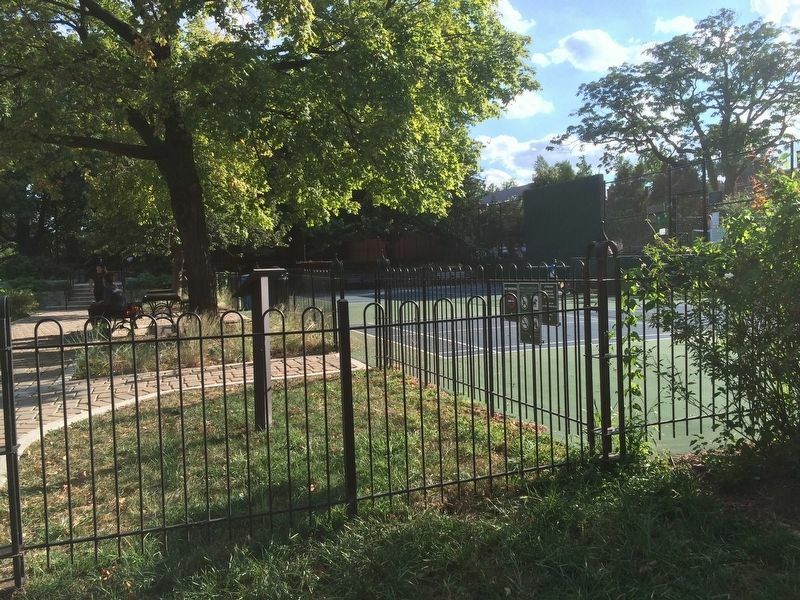 A view south from O Street towards the reverse of the marker and the Peters Sisters/Rose Park tennis courts. More. 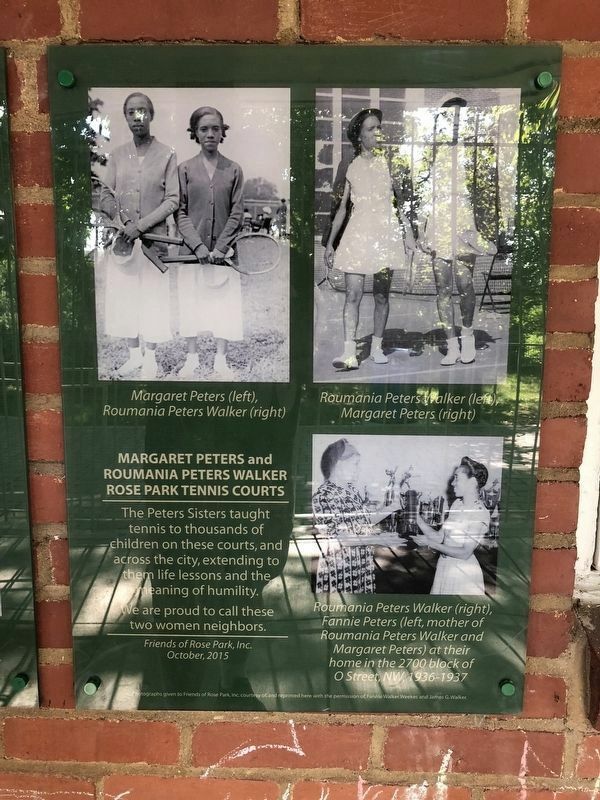 Search the internet for Margaret Peters and Roumania Peters Walker. Credits. This page was last revised on July 20, 2018. This page originally submitted on September 12, 2016, by J. Makali Bruton of Querétaro, Mexico. This page has been viewed 149 times since then and 5 times this year. Photos: 1, 2, 3. submitted on September 12, 2016, by J. Makali Bruton of Querétaro, Mexico. 4, 5, 6. submitted on July 20, 2018, by Devry Becker Jones of Washington, District of Columbia.